Welcome back for Part 3! Today we are going to implement the stopwatch. We are going to start off right where we left off. If you haven't worked through it yet, you can either head over to Part 1 and Part 2 or grab the Project Here for today's starting point. One of the key ingredients in calculating our reading rate is the time our user spent reading. 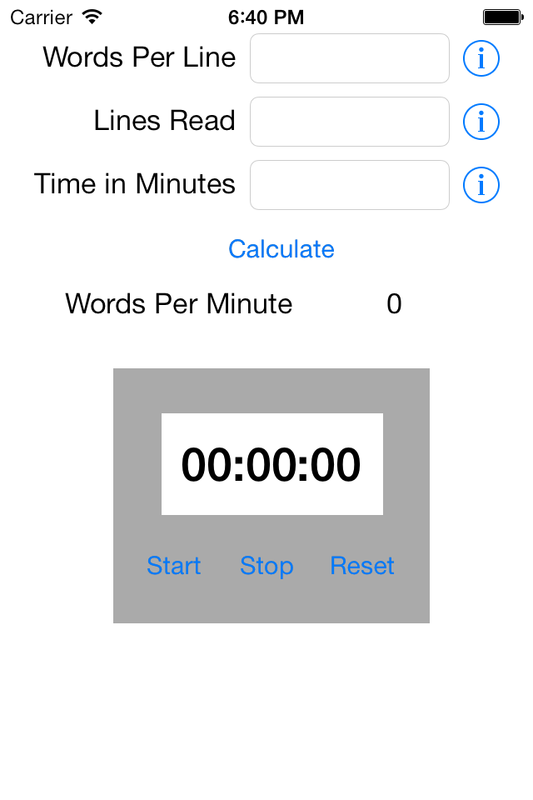 It would be annoying to make them use another app or device to keep track of the time for them, so we want to make our own stopwatch right on the calculator for them to use. Load your project and open up the Main.storyboard file. The first thing we want to do is check is to make sure Autolayout is off. Open up the right utility view by clicking the right panel button above View. Click on the File Inspector, and then make sure Autolayout is unchecked. We will spend some time on Autolayout later on in the series. For now, we are ready to add our new view elements. 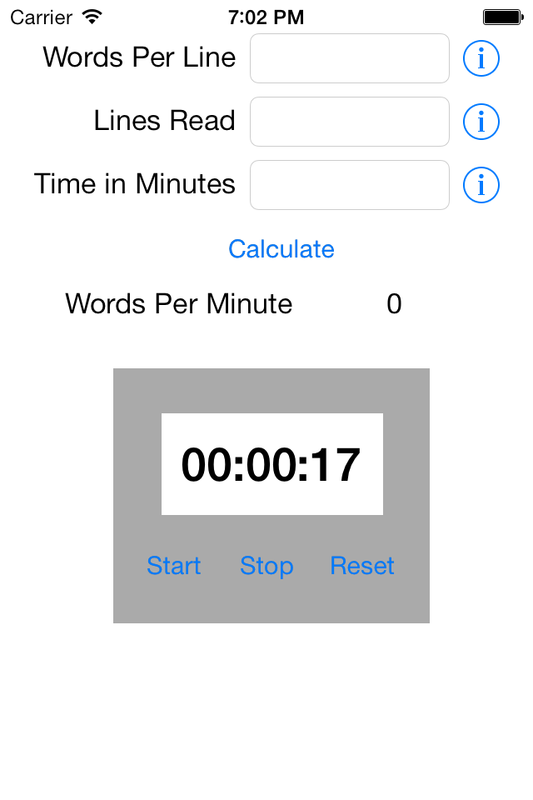 Drag on a new view to hold the stopwatch elements. Resize it to fill about a third of the full view just below our Words Per Minute label. Open up the Attributes Inspector to change the Background to the Light Gray Color option. This is to help distinguish the view from the rest of the calculator. Next, grab three Buttons and name them Start, Stop, and Reset. It would also be good to add some comments to your file to help with organization and readability. You can use "//" To start a singe line comment. Go ahead and add a comment above your stopwatch UI elements by adding "// Stopwatch Components". You will also want to go add a line about the calculator components by adding "// Calculator Components" near the top of the file. Here our createTimer function initializes an NSTimer object that fires once ever 1.0 seconds repeatedly. Every time it fires, it sends a message to the timerTicked function, which then increments the _currentTimeInSeconds property. Note that we prepend the property with an underscore. This is the variable automatically created by Xcode when we declare a property. This saves us from having to initialize the property ourselves. Less code to write for you! Where we have taken our integer total number of seconds and broken it up into its three parts. The number of seconds is the remained after dividing by 60. For the minutes, we first divide by 60, and then take the remained after a second division by 60. Lastly, the number of hours is simply the integer part of the total divided by 3600. The least step is to return the time as formatted string to give hh:mm:ss as would be expected on a digital clock. In this function we first make sure our currentTimeInSeconds variable exists, and we set it to 0 if not. Next, we check to see if our timer object exists, and if it does not, we create one by calling the createTimer function we just wrote. For the stop button, we simply want the stopwatch to stop counting. We can achieve this by calling the invalidate method on our timer object. Modify your stopButtonPressed function to call this method. We will need to invalidate the timer and recreate it to make sure the new timer is counting correctly. If we did not do this, hitting reset in the middle of the timer count would lead to the first second displaying more quickly than after one full second. This is just to help the user experience and ensure accuracy. Build and run your project to see you have a working stopwatch! A Little Extra - Challenge Edition! There are a few more features we can add to make for a better user experience. This time, however, I want you to try and figure them out on your own. We have already gone over enough that you should be able to work your way through these two tasks. Add functionality so that when you hit the stop button, timeInMinutesTextField is automatically updated. Format the number to be in minutes and have two decimal places. Most of the time when reading and testing your reading rate, you read for a few minutes or some time less than a full hour. Make it so the stopwatchTimeLabel has the format of mm:ss until the timer has been running for an hour, where the format changes to the current format. If you were to hit the home button on the simulator while the timer is running, you will notice that when you come back to the app, the time continues where you left off. This means you are not timing the absolute time, just the time the app is running and active. Find a way to track the full time. Hint: You may want to consider using the NSDate class. You have a Working Stopwatch! What's Next? Thank you for following our walk-through! We hope you found it helpful. In Part 4 we will show the solutions to today's challenges. After that, we will continue with our Read Rates app! Share with us your struggles, successes, and stories below! Nicholas M Schneider is a 2010 graduate from the Kate Gleason College of Engineering who is now a Doctoral Candidate at the University of Pennsylvania. Originally from an obscure town south of Buffalo, New York, he attended the Rochester Institute of Technology where he received concurrent Bachelor of Science and Master of Science degrees. While there he had a number of Co-ops including a six month stay as a Design Engineer at Lockheed Martin and Research positions with Dr. Satish Kandlikar. Nicholas currently works with Dr. Haim H Bau in the field dubbed “in situ electron microscopy of liquid systems” where he studies applications in energy and biological systems. Outside of the lab, Nicholas Schneider is a Graduate Associate in Rodin College House and enjoys running (he ran his second Philly Marathon this past November), cooking, baking, reading, and justifying his coffee addiction by making it a hobby.